When it comes to Internet service providers, many companies fail to deliver what they promise. In today’s era, any field that you look at requires a high-speed Internet. But with online presence comes the issue of cybersecurity. Although many companies provide services to protect you against cybercrime, at times these companies have to deal with threats as well. 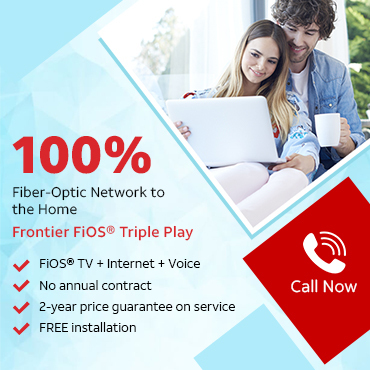 An example of a service that provides you online security is Frontier Communications Internet. You can rely on this company for some of the best high-speed Internet plans. This service that comes at an affordable price, protects your many devices against antiviruses. Apart from providing antivirus protection, it also provides Internet security against any hackers or criminals. This means that if you lose a smart-phone or a tablet, this service got you covered. Because subscribing to the multi-device security feature means that you can find your device. And you can even lock the access to your device(s). Apart from that, you also get an option to erase the data from your device(s) altogether. Moreover, this feature also allows you to add an extra layer of protection. Because you can opt for parental control. And decide what content your children should watch and what not. Many of you, if not all, know the struggle to remember gazillion passwords. This feature by Frontier Communications Internet services makes remembering passwords easier for you. As you do not have to remember any. Because the password manager does it for you. So, whether you have to carry out online banking or shop online, you can leave the worry of remembering the password on this feature. The good news is that this feature comes free when you subscribe to multi-device security. And it works by saving your passwords and credit card number securely. But you will have to remember a master password. It also guides you when your password is not that strong. And protects you against hackers. Btw as cool as it may sound, at times these features fail to protect you as well. In a recent incident, Frontier’s password bug let anyone into your account. This posed threat to the online subscribers. Although the users’ information was protected by two-factor authentication, still it wasn’t enough. This issue arose in the password reset system. Due to this, the users’ information was exposed to hackers and criminals. Security researcher Ryan Stevenson spotted this. And it meant that an attacker could get into your account with just a username or email address. However, Frontier Communications Internet was quick to take action. And resolved the issue. While you already read about the latter, there’s one thing you still need to know. Multi-device security protects up to ten of your devices. Now, let’s see what the former feature offers. So the Content Anywhere features stores your favorite content on the cloud. It has a storage capacity of 50 GB. And you can access it anytime you wish to. And that too on multiple devices. Apart from that, you also get an option to share your saved content on Facebook or Twitter. All you need is a Frontier Internet connection and your job’s done. These varieties of products allow you to live a digital life. And of course, live smarter. Your devices are covered for 12 months with this feature. And you can only make claims if a mishap like a spill or a drop happens. Whether you need a wireless connection or wish to scan your system against threats, the reps are there to help you. They will resolve your issues regarding the minutest issue. This includes trouble in your Frontier Communications Internet connection. Or your urge to install any popular software. And you are unable to. Because let’s face it, not everyone is tech savvy. And you do not need to anyway. When the efficient and courteous staff is there to assist you. Apart from the customer service reps, the technical support staff is available 24/7. The company’s reps are there to make your digital life a happy one. Previous PostPrevious What Channel Is HBO on Frontier? Next PostNext How Fast is Frontier Internet?